I’m actually in kind of a unique position. The first Zelda game that I ever played was actually the second game in the series, The Adventure of Link. Maybe it’s because of that that my experience wasn’t clouded by fond memories of playing the first game in the series. But I actually liked it quite a bit. A few years later, when I got my first Internet access, I would quickly discover that a lot of folks consider this game to be the red-headed stepchild of the series for some reason. The game is a direct sequel to the first Legend of Zelda game, which is actually a rarity for the series. Link has to revive Zelda from her mysterious slumber by traveling the land and sticking jewels into statues that are in castles hidden all over the landscape. Oh, and stopping Ganon from being resurrected while you’re at it. But the game breaks with some of the mechanics from the first game, most of them are pretty negligible, but there are two that stand out: the side-scrolling adventure mode and the experience point system. The original Zelda game was top-down only. We’ll go in depth with it another day, but basically everything happened on a giant grid that you had to explore. In this game the overworld is pretty huge, but it looks more like a map than anything else. When you walk along anything that’s not a path these shadowy things appear. Touch one of them and you’re whisked away to what amounts to a sidescrolling platform game where you do your fighting. Similarly, the castles, towns, and dungeons are all presented in this way. They’re pretty much the same as the ones in the previous game except laid out in the opposite dimension. And all that really means is that you have to enemies being higher or lower than your sword (dimensions are fun!) and there are some places where Link will have to jump (*gasp!*). This, I don’t have a problem with. The other big change is the experience point system, which hasn’t made an appearance in any other game in the series (that I know about). But, essentially, every time you kill an enemy you get a certain number of points based on how tough the monster is. Get a certain number of points and you can increase an attribute (attack power, life, or magic) which just gives you slightly more and makes you a bit stronger. This is a little bit different from the old game where you just found better stuff, and didn’t have discrete levels. But, since I hadn’t played that game, I didn’t have a problem with this either. Towns were also added in, which, looking back, was pretty nice. The first game had Link as the only person in the world, besides the old men that lived in caves. This made the game actually feel like there were more people in the world that might be affected by the story. I don’t know if anyone really disliked the towns, but I thought they were appropriate. I played this game a whole lot when I first got my hands on it. I loved being able to walk around on the giant map screen and then to zoom down the extreme closeup of the action stages. Even when I managed to jump directly into pits instead of over them about half the time. I reveled in finding the hidden secrets and figuring out how to advance the game. This was pre-internet and pre-strategy guide, so I wandered around the countryside for ages trying to figure out where the town was hidden in the forest, or how to make the river monster move out of the way, or why I would lose life when I was in a certain area even though nothing was there. Each time I did it, I felt like I was on top of the world for a few picoseconds, until the next head-scratcher. I did finally, finally make it to the end of this game after months upon months of playing it. But I was only able to beat the thing one time. One time I was able to take my paltry allotment of lives and brave the labyrinthine final castle. One time I was able to thwart the evil within, defeat my own shadow, save the princess, and win the day. And I’m going to cling to that one time for the rest of my days. 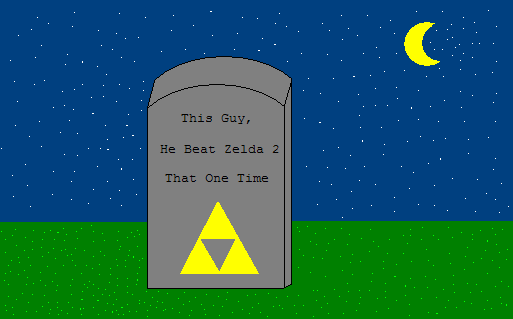 It might be my epitaph: “This guy, he beat Zelda 2 that one time”. This entry was posted on Tuesday, April 15th, 2008 at 1:13 pm	and is filed under GameCube, NES. You can follow any responses to this entry through the RSS 2.0 feed. You can leave a response, or trackback from your own site. Somebody bothered to finish this game? Hmm…..
Did you like… have a party when you beat it? Only if dancing around the room a little bit counts as a party… Which I think does. so how in the world did you defeat that river monster? I’m trying to get past it now! You have to get the flute at the Oceam Palace, and then press ‘A’ next to him on the overworld map. Then he’ll disappear.